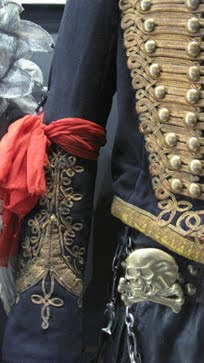 WAIST HIGH: Adam Ant's Kings Of The Wild Frontier Jacket On Display At The BME. Adam Ant's Kings Of The Wild Frontier Jacket On Display At The BME. From adam-ant.net: The British Music Experience opened at the O2 Arena, London in March 2009 and is a celebration of British popular music from the 1940s to the present day. The displays and exhibitions detail the history and include some of the defining moments over these decades and have on display costumes and memorabilia from Bowie, The Beatles, Stones (Rolling and Roses), sections on Punk, Two Tone and Brit Pop amongst many others. Of special interest to (Adam Ant fans) in the exhibition/experience is the inclusion of one of the Kings of the Wild Frontier Hussars jackets as worn by Adam during the early eighties (he did own more than one). The jacket is part of the stage costumes as worn during the Ants Invasion, Frontier and Stand and Deliver tours in 1980 and 1981. Adam acquired the jacket in May 1980 in preparation for the first tour that would showcase the new Adam and the Ants along with a fresh and exciting sound. The accompanying look was a colourful mix of buccaneer and Native American. Speaking in November 2009, Adam said: "It's smashing, they did a really good job there. My stuff looked good, it was in really good shape. I'll eventually give them (the V&A) everything that I can find." The jacket had previously been used and worn by the actor David Hemmings for the 1968 film The Charge of the Light Brigade where he played the part of Captain Louis Edward Nolan, the Aide-de-Camp to Brigadier-General Airey. Kings of the Wild Frontier was released in 1980 and went to #1 in the UK. The album produced three singles, "Dog Eat Dog," "Antmusic," and "Kings of the Wild Frontier." Kings of the Wild Frontier is included in the book 1001 Albums You Must Hear Before You Die.